You have to have Painter Classic or an other version of Painter to follow this lesson. You also need a Graphics Tablet. Preferably a Wacom Intuos with a standard pen. For general use of Painter we recomend a minimum resoultion of 1024*768 in True color, but a resoultion of 1280*1024 or 1600*1200 in True color is prefered. I did a photo of three brilliant speciments sitting on a woodplate. As an extra touch I pour some water over them which allow some nice highlights for us to capture. The idea was that you download the full resolution photograph of the tomatoes and the full resolution sketch, but you can of course create your own sketch if you prefer so. 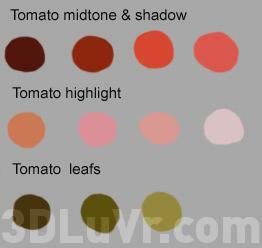 The reference photo features three tomatoes, but for this lesson I'm only going to paint the two in the forground. First step is to fill the sketch with some main colors. Instead of giving you the colors in RGB numbers, I have created a 'palette' with the main colors I have used. Save this image to your computer too and have it open in Painter Classic beside with the sketch. Use the color picker tool to pick up colors from the 'palette'. An explanation on how to use the color picker is to be found in Lesson 1 (or you could look in the manual). The 'palette' with the main colors used in the painting.